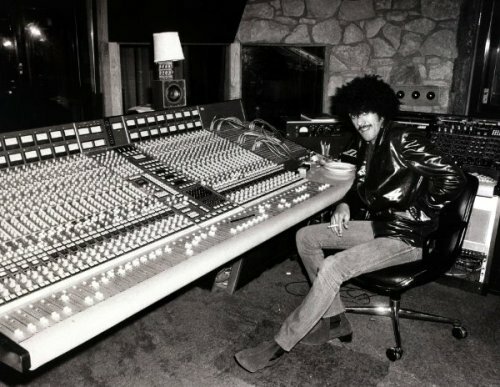 Steven Stancell | stevenstancell.com | Blog : WHERE’S PHIL LYNOTT’S PROPS? Seems like people have forgot about Phil Lynott. He headed the group Thin Lizzy, the band known for its dual lead guitars. If you’re not familiar with the band, you can hear elements of them in some of Bruce Springsteen’s earlier work. Thin Lizzy had hits with “The Boys Are Back in Town,” “Jailbreak” and “Don’t Believe A Word,” to name a few. Phil Lynott, who hailed from Ireland, was a black man, with an Irish mother and a father from Guyana. He was a black Irishman, and he accepted who he was, even while friends said he might have been the only black man in the entire country at the time. On top of that, Lynott was completely rock ‘n’ roll, with the leather, chains, big afro, and all that. Considering the work he and his band put out here, it’s been a mystery to me why he never seemed to get the attention he deserved while he was alive. (He died in 1986 from pneumonia and heart failure.) Lynott and the band were in the news recently, when it was reported that Lynott’s mother, said that her son would not be pleased that the Republicans were using her son’s “The Boys Are Back in Town” song at their convention. She said he would’ve disagreed with their position on gay marriage and taxes. For more on Phil Lynott and his work, go to http://www.philiplynottexhibition.com and learn about the man considered to be Dublin’s ultimate rock star.